Johnny runs as fast as he can to chase his friend down the sidewalk. It isn’t usually this foggy when he walks to school, but this time of year, the dawn breaks about half way along his routine journey. Johnny closes in on Tommy as they near their usual finish line, the last street sign before they cross the busy street in front of their school. The race is closer than it has ever been. Johnny runs as fast as he can. His fingers barely miss Tommy’s shirt flapping just out of reach. In the instant, the race is over Tommy has no time to gloat. A grown man’s arm thuds against their chests just as a red sports car whizzes no more than three feet from their noses. The exhaust fumes irritate their already overworked lungs. “You boys need to watch where you’re going! You could have been killed!” The crossing guard looks at them in disgust, his eyes still wide from the close encounter with the car. Johnny and Tommy knew realized they lost control and that if the crossing guard had not had cat-like reflexes, they could have been seriously injured or killed. 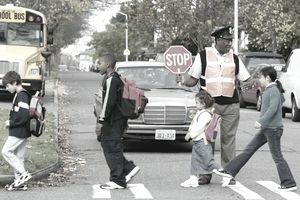 Crossing guards protect children on their ways to and from school ensuring the children make it safely across streets. A job as a crossing guard is not something one takes as a start to a career. Individuals who work another job from home and those with flexible hours may take on a crossing guard job for side money. It is a seasonal part-time job that only takes a few hours a day, but it is critical to children’s safety. Crossing guards are hired through the normal government hiring process. Because crossing guards work alone with children, school districts usually conduct extensive background checks on applicants to these positions. They are supervised by a manager in the district’s central office. That manager is responsible for selecting new crossing guards. At most, crossing guard positions may require a high school diploma or GED. It is helpful for crossing guards to be licensed drivers so they know what it is like for drivers to interact with crossing guards. When crossing guards are licensed drivers, they also know the common mistakes drivers tend to make and how to prevent them from happening. Applicants for crossing guard positions do not need any specific experience. All the necessary training is provided by the school district. It is helpful for applicants to have some meaningful work experience so the hiring manager knows the applicant can successfully hold a job. Any gaps in employment history should be explained on the application form. Crossing guards help children safely cross streets near schools. They only work a few hours a day, during the hour or so immediately preceding and following the school day. While the children are in school and under the supervision of teachers, crossing guards are not needed. Crossing guards are strategically positioned at intersections or crosswalks with high volumes of foot traffic or vehicle traffic. So they can be identified by school children and seen by drivers, crossing guards wear brightly colored vests or jackets and carry large stop signs. When children come to a crossing guard’s location, the crossing guard assesses the vehicle traffic to determine when the children can safely cross the street. For intersections and crosswalks with pedestrian lights, the crossing guard can hold the children until the sign indicates that pedestrians can cross. Small children often do not understand the lights or forget they are present. The crossing guard can also walk out into the street holding up the stop sign. Drivers must stop for crossing guards. The crossing guard stands in the middle of the street holding up the sign until the children have crossed the street. When crossing guards see drivers violating traffic laws, they take down vehicle license plate numbers. They report the numbers to police and school officials. If police notice a pattern of traffic violations around a school, they may send police officers to patrol the area looking for particular violations. Crossing guards also report misbehaving children to teachers or principals. Undisciplined children can be more than a nuisance around busy streets; they can endanger themselves, other students and drivers. A crossing guard’s work is performed outside. Protective clothing may be necessary on days with heavy precipitation or at duty locations without shade. If schools are closed, the crossing guards do not report for duty. According to 2014 data from the US Bureau of Labor Statistics, crossing guards earn an average of $13.00 per hour. The median wage is $11.90 per hour. The bottom 10% of crossing guards earn $8.42 per hour or less while the top 10% earn $18.53 per hour or more.